For a bike-infrastructure geek like myself, this is the most exciting time of the year, when the city is in the thick of rolling out the season’s new lanes. 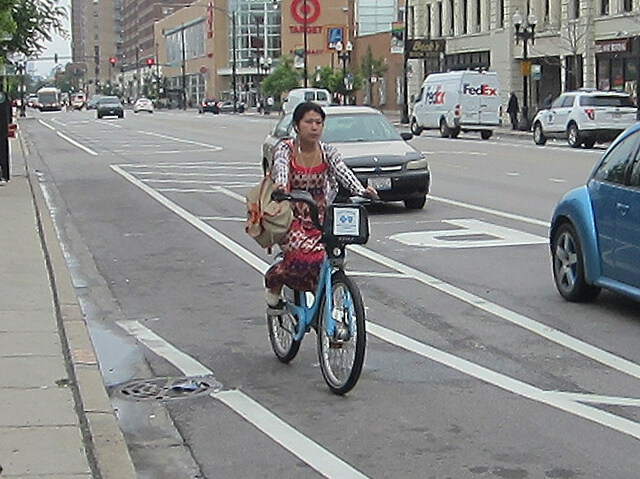 Most of the twenty miles of new bikeways planned for 2014 aren’t as groundbreaking as in previous years, when protected lanes debuted on Kinzie, Dearborn and Milwaukee. However, there are some interesting projects going in this year, and it’s always a treat to ride a bikeway for the first time, a thrill akin to unwrapping a present. 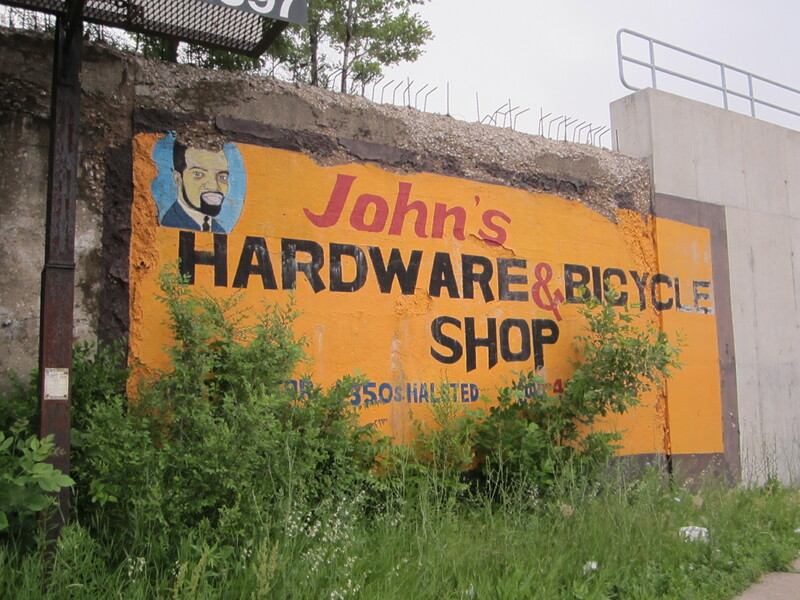 I set out to pedal a gaggle of new lanes, a journey that will take me many miles from Edgewater on the North Side to Auburn Gresham on the South Side to Little Village on the West Side. I start my trip at Bryn Mawr and Sheridan, where I’m pleased to see that the Chicago Department of Transportation has solved an annoying problem. Previously, the street ran one-way westbound under Lake Shore Drive, with a two-lane onramp for drivers heading southbound on the drive. That meant that to access the Lakefront Trail, people on bikes had to cross two lanes of right-turning car traffic, and then take the sidewalk or bike through a yellow-striped no man’s land under the drive. CDOT eliminated one of the two onramp lanes to make room for an eastbound “contraflow” bike lane that escorts cyclists to the lake in relative safety. Along the way, they can enjoy views of a colorful mosaic in the viaduct, featuring scenes from the neighborhood plus images of giant birds, bugs, and fish. There’s also a new westbound buffered lane here that I take into the Bryn Mawr Historic District, which contains some of my favorite local Art Deco buildings. Heading south on Broadway, past the Southeast Asian business district on Argyle, I see a procession with dozens of orange-clad Buddhist monks. Onlookers put donations in their alms bowls. CDOT will be striping buffered lanes on Broadway from Foster to Wilson, and is currently building protected lanes from Wilson to Montrose, at a total cost of $200,000. This project will reconfigure the street from four car lanes to two, which will discourage speeding. The protected lanes are largely completed, and most cars parked along the PBLs are where they should be, to the left of the curbside bike lanes. However, a few drivers have missed the memo, and their cars are clogging the bike lanes. When I explain this to a cabbie who’s returning to his taxi, parked curbside, he thanks me. “I’ve never seen this kind of parking before,” he says. “Oh man, it looks so dumb.” Oh well, there’s a learning curve for everything. 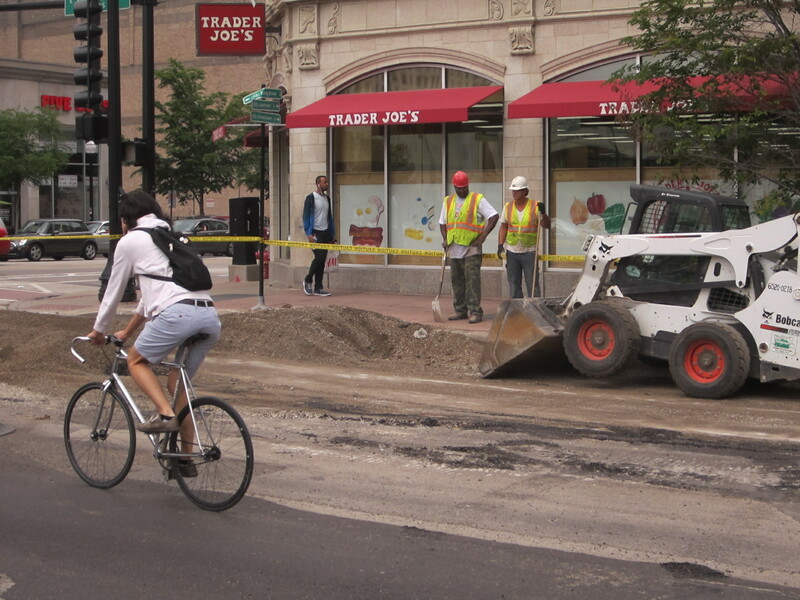 I make my way to the South Loop, where workers are tearing up Roosevelt in preparation for the city’s first sidewalk bike lanes, from Wabash to Indiana, which will provide easier access to the Lakefront Trail. The two-way lanes will be located on the north sidewalk of Roosevelt, and separated from pedestrians by a line of trees. From there, I roll to Bridgeport. 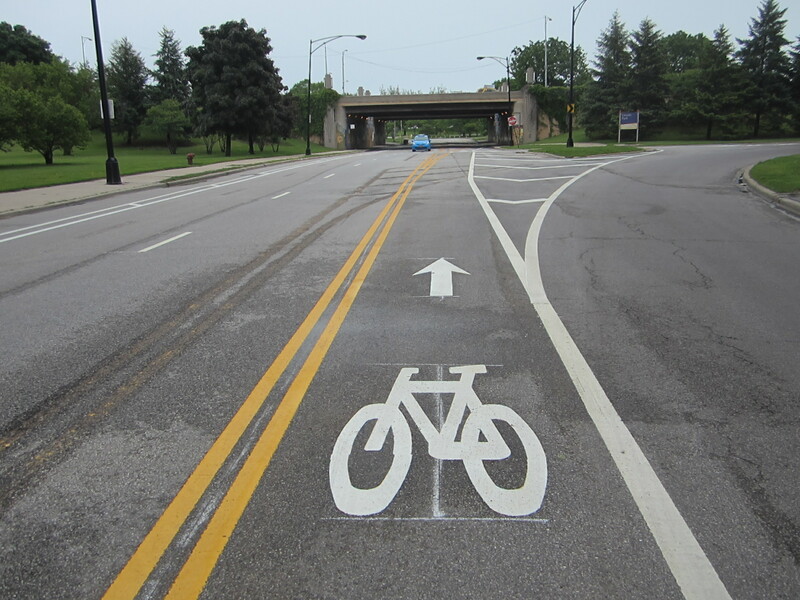 Last year, the city installed buffered lanes on most stretches of Halsted between Harrison and Garfield. They’ve recently filled in some of the blanks and extended the lanes a few miles further south. New BBLs have been installed on Halsted from 26th to 31st, past the manmade mini-mountain in Stearns Quarry Park, and banners hang above them advertising Chicago Bike Week. Rahm Emanuel will likely give a speech boasting of the city’s cycling accomplishments at a breakfast rally in Daley Plaza this Friday, June 20, from 7am to 9am. Inexplicably, the badly faded conventional bike lanes on Bridgeport’s main drag, south of 31st, have not been re-striped, let alone upgraded. At 47th, I head west to Racine, where the city has striped new buffered lanes on a short stretch just south of the stockyards. The street, lined with clapboard houses and brick two-flats, would be quaint if it wasn’t for a number of boarded-up buildings. I return to Halsted to check out more stretches of new buffered lanes south of Garfield. On the 6100 block of South Halsted, a photo mural features images of workers picking cotton, a train hall full of Great Migration-era travelers, and the famous image of three sharp-dressed boys sitting on the hood of a fancy car in Bronzeville on Easter Sunday, 1941. The lanes end at 85th, and from there you can take protected lanes on Vincennes southwest to meet up with the Major Taylor Trail. I’ve got one more new buffered lane street to check out: 26th between Pulaski and Kostner. I make my way west to Pulaski, where I throw my bike on the front rack of a #53 bus and ride it up to Little Village. There I’m greeted by the sight of colorful pushcarts on every corner, hawking Mexican snacks and produce. The conventional bike lanes on 26th have been ground out and replaced by BBLs with the buffer on the right, to help keep cyclists from getting struck by opening car doors. The lanes are getting good use from blue-collar workers coming home during the evening rush. Mission accomplished, I make my way back home with the sound of norteño music ringing in my ears.